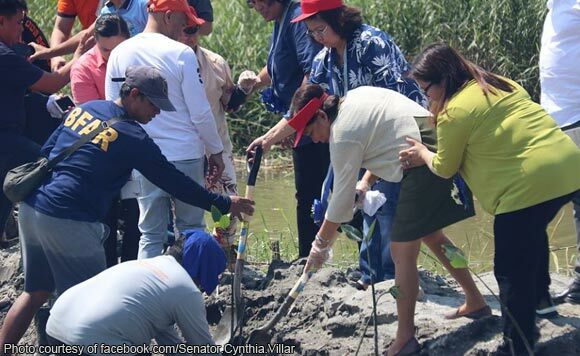 Senator Cynthia Villar joined provincial officials in the coastal clean-up early this week in Bataan. Bataan 1st District Representative Geraldine Roman led local politikos in welcoming Villar, who chairs the Senate Committee on Agriculture and Food, in her hometown of Orani, which is the last stop of the series of coastal cleanups in Central Luzon initiated by the Bureau of Fisheries and Aquatic Resources Region III. “It was a a big honor for me to take part in this event, along with the Usec. Ed Gongona of the BFAR, (BFAR) Regional Director Lilian Garcia, Governor Abet Garcia, Vice Governor Cris Garcia, Mayor Bonjong Pascual, Vice Mayor Godofredo Galicia, as well as representatives from concerned government agencies, various students, volunteers and fisherfolk,” Roman said on her Facebook account. “Taking care of our environment and our natural resources is extremely important,” she added. According to a post about the event on Villar’s Facebook page, the BFAR is one of the 13 government agencies tasked by the Supreme Court Mandamus to preserve Manila Bay. “The Manila Bay is, unfortunately, in worse shape now than it was a decade ago. We must do all that we can to raise awareness on this issue and save this cultural and historic landmark known all over the world for its breathtaking sunsets,” Roman said. Aside from the clean up and the signing to the pledge of support to make Manila Bay MMK, the officials and other participants planted mangroves, and held an awarding of fiber glass boats and trash boats, and fishing gears and paraphernalia to fisherfolks. The activities also included stocking of bangus fry.